Valence: The electrons in the outer most shell, or valence shell, are known as valence electrons. These valence electrons are responsible for the chemical properties of the chemical elements. It is these electrons which participate in chemical reactions with other elements. An over simplified chemistry rule applicable to simple reactions is that atoms try to form a complete outer shell of 8 electrons (two for the L shell). Atoms may give away a few electrons to expose an underlying complete shell. Atoms may accept a few electrons to complete the shell. These two processes form ions from atoms. Atoms may even share electrons among atoms in an attempt to complete the outer shell. This process forms molecular bonds. That is, atoms associate to form a molecule. For example group I elements: Li, Na, K, Cu, Ag, and Au have a single valence electron. (Figure below) These elements all have similar chemical properties. These atoms readily give away one electron to react with other elements. The ability to easily give away an electron makes these elements excellent conductors. Periodic table group IA elements: Li, Na, and K, and group IB elements: Cu, Ag, and Au have one electron in the outer, or valence, shell, which is readily donated. Inner shell electrons: For n= 1, 2, 3, 4; 2n2 = 2, 8, 18, 32. Group VIIA elements: Fl, Cl, Br, and I all have 7 electrons in the outer shell. These elements readily accept an electron to fill up the outer shell with a full 8 electrons. (Figure below) If these elements do accept an electron, a negative ion is formed from the neutral atom. These elements which do not give up electrons are insulators. Periodic table group VIIA elements: F, Cl, Br, and I with 7 valence electrons readily accept an electron in reactions with other elements. For example, a Cl atom accepts an electron from an Na atom to become a Cl- ion as shown in Figure below. An ion is a charged particle formed from an atom by either donating or accepting an electron. As the Na atom donates an electron, it becomes a Na+ ion. This is how Na and Cl atoms combine to form NaCl, table salt, which is actually Na+Cl-, a pair of ions. The Na+ and Cl- carrying opposite charges, attract one other. Neutral Sodium atom donates an electron to neutral Chlorine atom forming Na+ and Cl- ions. 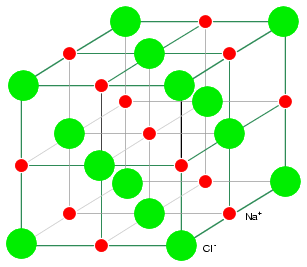 Sodium chloride crystallizes in the cubic structure shown in Figure below. This model is not to scale to show the three dimensional structure. The Na+Cl- ions are actually packed similar to layers of stacked marbles. The easily drawn cubic crystal structure illustrates that a solid crystal may contain charged particles. Group VIIIA elements: He, Ne, Ar, Kr, Xe all have 8 electrons in the valence shell. (Figure below) That is, the valence shell is complete meaning these elements neither donate nor accept electrons. Nor do they readily participate in chemical reactions since group VIIIA elements do not easily combine with other elements. In recent years chemists have forced Xe and Kr to form a few compounds, however for the purposes of our discussion this is not applicable. These elements are good electrical insulators and are gases at room temperature. Group VIIIA elements: He, Ne, Ar, Kr, Xe are largely unreactive since the valence shell is complete..
Group IVA elements: C, Si, Ge, having 4 electrons in the valence shell as shown in Figure below form compounds by sharing electrons with other elements without forming ions. This shared electron bonding is known as covalent bonding. Note that the center atom (and the others by extension) has completed its valence shell by sharing electrons. Note that the figure is a 2-d representation of bonding, which is actually 3-d. It is this group, IVA, that we are interested in for its semiconducting properties. (a) Group IVA elements: C, Si, Ge having 4 electrons in the valence shell, (b) complete the valence shell by sharing electrons with other elements. Crystal structure: Most inorganic substances form their atoms (or ions) into an ordered array known as a crystal. The outer electron clouds of atoms interact in an orderly manner. Even metals are composed of crystals at the microscopic level. If a metal sample is given an optical polish, then acid etched, the microscopic microcrystalline structure shows as in Figure below. It is also possible to purchase, at considerable expense, metallic single crystal specimens from specialized suppliers. Polishing and etching such a specimen discloses no microcrystalline structure. Practically all industrial metals are polycrystalline. Most modern semiconductors, on the other hand, are single crystal devices. We are primarily interested in monocrystalline structures. (a) Metal sample, (b) polished, (c) acid etched to show microcrystalline structure. Many metals are soft and easily deformed by the various metal working techniques. The microcrystals are deformed in metal working. Also, the valence electrons are free to move about the crystal lattice, and from crystal to crystal. The valence electrons do not belong to any particular atom, but to all atoms. The rigid crystal structure in Figure below is composed of a regular repeating pattern of positive Na ions and negative Cl ions. Once the Na and Cl atoms have formed Na+ and Cl- ions by transferring an electron from Na to Cl, with no free electrons. Electrons are not free to move about the crystal lattice, a difference compared with a metal. Nor are the ions free. Ions are fixed in place within the crystal structure. Though, the ions are free to move about if the NaCl crystal is dissolved in water. However, the crystal no longer exists. The regular, repeating structure is gone. Evaporation of the water deposits the Na+ and Cl- ions in the form of new crystals as the oppositely charged ions attract each other. Ionic materials form crystal structures due to the strong electrostatic attraction of the oppositely charged ions. NaCl crystal having a cubic structure. Semiconductors in Group IV also form crystals because of the tetrahedral bonding pattern of the s2p2 electrons about the atom, sharing electron-pair bonds to four adjacent atoms. (Figure below(a) ) More correctly the four outer electrons: two in the s-orbital, (sz) offset along the z-axis, and two in the p-orbital (px and py) hybridize to form four sp3 molecular orbitals. These four electron clouds repell one another to equidistant tetrahedral spacing about the Si atom, attracted by the positive nucleus as shown in Figure below. Two s-orbital (sz ) electrons and two p-orbital (sx and sy ) electrons hybridize, (c) forming four sp3 molecular orbitals. Every semiconductor atom, Si, Ge, or C (diamond) is chemically bonded to four other atoms by covalent bonds, shared electron bonds. Two electrons may share an orbital if each have opposite spin quantum numbers. Thus, an unpaired electron may share an orbital with an electron from another atom. This corresponds to overlapping Figure below(a) of the electron clouds, or bonding. 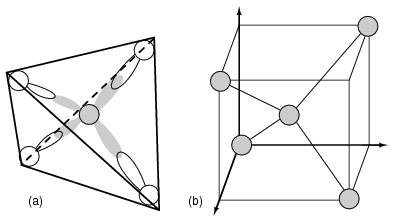 Figure below (b) is one fourth of the volume of the diamond crystal structure unit cell shown in Figure below at the origin. The bonds are particularly strong in diamond, decreasing in strength going down group IV to silicon, and germanium. Silicon and germanium both form crystals with a diamond structure. The diamond unit cell, the basic crystal building block, in Figure below shows four atoms (dark) bonded to four others within the volume of the cell. This is equivalent to placing one of Figure above(b) at the origin in Figure below, then placing three more on adjacent faces to fill the full cube. 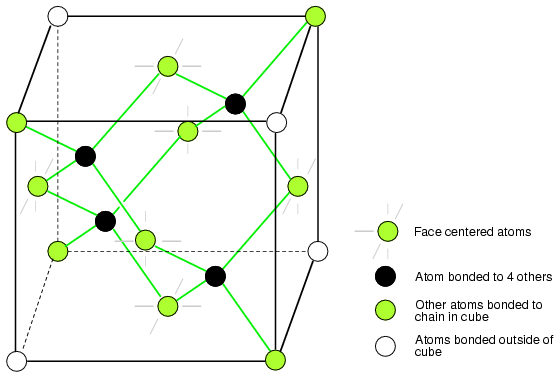 Six atoms fall on the middle of each of the six cube faces, showing two bonds. The other two bonds to adjacent cubes were omitted for clarity. Out of eight cube corners, four atoms bond to an atom within the cube. Where are the other four atoms bonded? The other four bond to adjacent cubes of the crystal. Keep in mind that even though four corner atoms show no bonds in the cube, all atoms within the crystal are bonded in one giant molecule. A semiconductor crystal is built up from copies of this unit cell. Si, Ge, and C (diamond) form interleaved face centered cube. The crystal is effectively one molecule. An atom covalent bonds to four others, which in turn bond to four others, and so on. The crystal lattice is relatively stiff resisting deformation. Few electrons free themselves for conduction about the crystal. A property of semiconductors is that once an electron is freed, a positively charged empty space develops which also contributes to conduction. Atoms try to form a complete outer, valence, shell of 8-electrons (2-electrons for the innermost shell). Atoms may donate a few to expose an userlying shell of 8, accept a few to complete a shell, or share electrons to complete a shell. Atoms often form ordered arrays of ions or atoms in a rigid structure known as a crystal. A neutral atom may form a positive ion by donating an electron. The group IVA semiconductors: C, Si, Ge crystallize into a diamond structure. Each atom in the crystal is part of a giant molecule, bonding to four other atoms. Most semiconductor devices are manufactured from single crystals.